It gives me great pleasure to reveal to you all the latest in my series of interviews exclusively here on fashioneyesta.com. 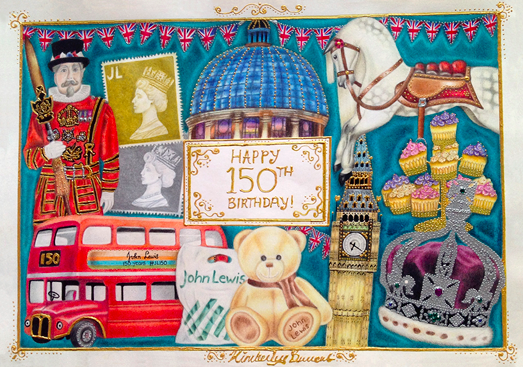 The latest reveals one of the most inspirational individuals I have ever come across Miss Kimberly Burrows acclaimed as the RNIB’s winner of the illustrator of the year, publishing her works exclusively for the RNIB Insight Magazine and working with charities such as Henshaw and living paintings. She is a true inspiration and shows that how the the right confidence you can still achieve your goals in life. Would you like to first of all tell us a bit about yourself and how you came to be an illustrator? Hello, Fashioneyesta readers! 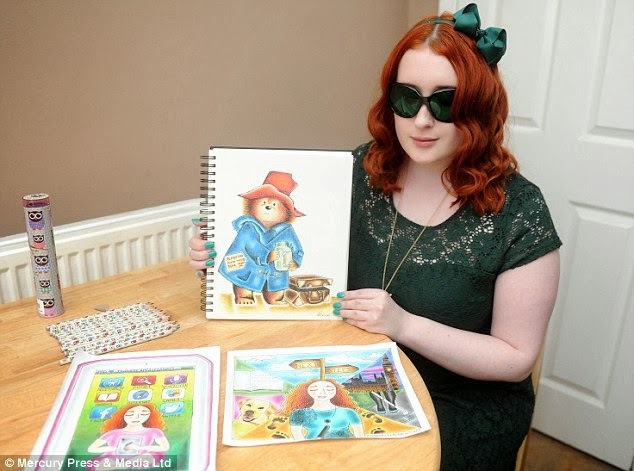 I’m Kimberley Burrows and I’m the RNIB’s Young Illustrator for 2014. I’m also a blogger, running my own blog as well as contributing to the Henshaws and Living Paintings blogs. I must admit that I didn’t originally set out to become an illustrator, it just sort of happened! I’ve always had a keen interest in drawing and painting, but illustrating is a recent route that I’ve taken within the past few years after rediscovering some of my favourite children’s books. It feels like fate though, and like I’m where I’m supposed to be! How long have you been painting and drawing for? For as long as I can remember! My mum and I used to travel to London from Manchester, starting from when I was 4 years old up until I was 17, to visit Great Ormond Street Children’s Hospital for my appointments and operations regarding my eyes and ears. There would always be a selection of paper, crayons and crafty items to be creative with, and that was always something to look forward to when sitting in the waiting area. Art was my favourite subject throughout the course of my school life, from my first years at primary school up until my final 2 years in high school when I took the subject for my GCSE’s. Did you always know you wanted to illustrate? I always had an inkling that I’d be doing something art-related with my life from early on, but I didn’t think it would take the illustration route until the past few years. Then the opportunity to become the RNIB’s Young Illustrator of the Year presented itself in November, and I spent the majority of the month working on my competition entry before sending it off and soon finding out that I had won in December. I now produce an illustration for each issue of the RNIB’s Insight Magazine and will continue to do so throughout the rest of the year. Illustrating is certainly something that I would love to continue with for as long as I possibly can. Do you have any inspirations or people who inspire you? I’ve always been inspired by the illustrations found in children’s books. I would buy the large print versions of my favourite books as a child and place them underneath my CCTV screen magnifier so that I could zoom in as much as possible to see the details I wouldn’t have been able to otherwise. I especially loved the Paddington Bear series, the animal tales from Beatrix Potter, Matilda and George’s Marvellous Medicine by Roald Dahl and the Old Bear stories by Jane Hissey. Michael Bond OBE, the author of the Paddington Bear books, is my biggest inspiration and my personal hero, and I was very lucky to have met him at his home in London in 2012. Do you use any assistive technology to aid you with your illustrating? Unfortunately, there aren’t too many items available to aid with drawing as a severely visually impaired person. The only device that I have is a Daylight lamp which helps to illuminate the piece I’m working on. I will sometimes use a folding bed table at a 70° angle, similar to an easel, to bring the work as close as possible to me. Everything else is down to organisation! I’ve rearranged my mediums with large print or Braille labels and organised them into different patterned tins in alphabetical order for easy access. I’ve stored and displayed my brushes from thickest to finest, acrylics to watercolours. I always keep a scrap piece of paper nearby when I’m working so that, if I’m unsure of a particular colour that I’ve selected, I can swatch it before using it. There are many times that I’ve confused a blue pencil with a purple one – and vice versa! Aside from that, I just use little techniques that I’ve found to be useful in my illustrating – such as drawing with a black fineliner, rather than a pencil which I struggle to see, and positioning my free hand around the edges of an outline, so that when I’m shading into the shape I don’t go over the edges and will come into contact with my hand instead. What aspects of life do you particularly like to illustrate? I try to illustrate as many things as I possibly can to add to variety my portfolio. I especially love sketching my favourite characters such as Paddington Bear and Peter Rabbit, and also creating my own. As the illustrator for the RNIB’s Insight Magazine each issue calls for a different theme, so I always try to illustrate situations or items that I’m familiar with to make the illustration as personal as possible, and to present my own encounter with the chosen theme. 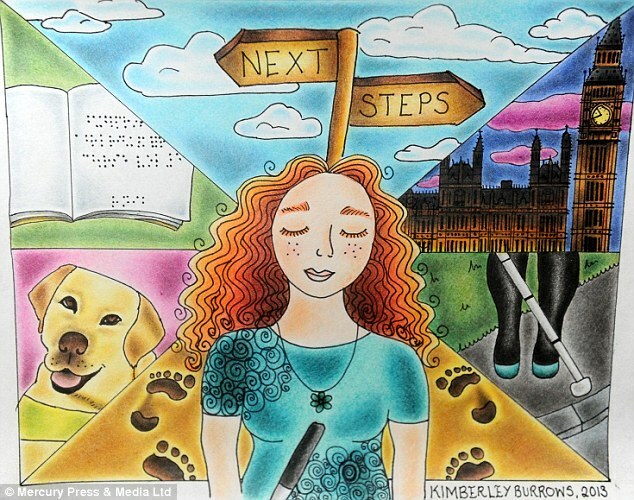 At the moment, with Insight Magazine, I’m illustrating different situations regarding my sight loss – such as ‘next steps’ where I illustrated a Guide Dog and Braille book to signify soon training for my own Guide Dog and completing my Braille course at Henshaws. Another illustration called for ‘accessible technology and apps’, so I portrayed my iPad with my favourite functions and applications inside, and another illustration was based on ‘preparing for adult life’, where I illustrated shopping independently, managing money, paying bills, preparing meals safely and washing clothes. Do you have any tips for someone with sight loss who wants to get into art? Please don’t think that there is an invisible barrier stopping you from being creative; whether it’s self-doubt, self-conciousness or anxiety. Do what you love and what makes you feel good, regardless of ability. Do things for yourself because you want to, rather than for other people. Any obstacle can be overcome, it’s about breaking down that barrier and showing everyone that you can do it. What are your future goals for your career as an illustrator? I’d love to go back to college after I’ve trained for my Guide Dog and have been matched up in a working partnership. That will really boost my confidence and enable me to be more independent. I’d like to then achieve my goal of studying fine art at the Royal National College for the Blind in Hereford. I didn’t enjoy my time at a mainstream college, and would like to have another go at further education in a place where there would be a lot more understanding and support for someone with a severe visual impairment. After I’ve experienced college and achieved more qualifications, I’d like to be a children’s book illustrator and perhaps even write and illustrate my own books in the future! It is clear from the pictures of yourself that you have your own unique sense of style. Do you feel that your artistic flare has a relationship to your fashion sense? Most definitely! I love being creative with my fashion as well as my illustrations. I love to be colour co-ordinated, so use an RNIB PENfriend to label my items of clothing, beauty products and accessories and use handy organisation tips to have easy access to my headbands and jewellery. I love experimenting and accessorising to really complete an outfit, and think I successfully portray on the outside who I am on the inside – colourful and quirky! Finally, do you feel that your contribution to the art world has aided in changing peoples perceptions of sight loss and their relationship to art? Do you feel there is more work to be done? I do hope that I have contributed to the art landscape in some small way and perhaps changed some people’s perception in how they regard someone with a sight impairment, both online and away from the computer. 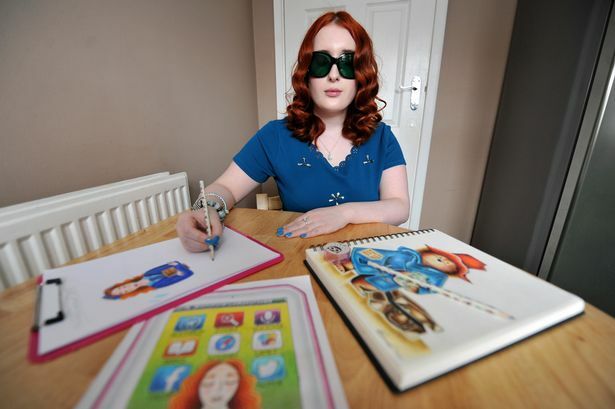 I have certainly accomplished this in my local area, where I was featured in local newspapers and on Granada Reports earlier in the year for my illustrations as a severely visually impaired person. It got people thinking and they would approach me saying that they saw me on the television and had no idea that it was possible for someone with so little sight to illustrate and create detailed drawings. It takes a lot of time and dedication to create my illustrations, so I’m pleased that it started conversations, piqued interest and showed that there are certainly abilities within someone’s disability. I do feel that there is more work to be done. 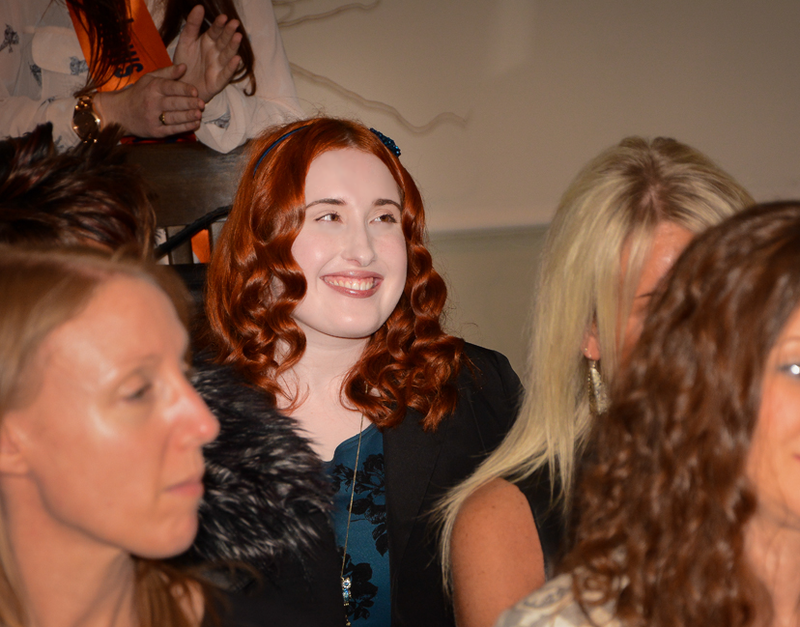 There are a lot of people out there unaware of what visually impaired people can do – and hopefully one day we can reach larger audiences and show that we can be creative with fashion, art and illustration, and anything else that we want to accomplish. It may take more time and a different approach in comparison to a fully-sighted person, but it can be done! Any Social links you want to mention? I suppose I’ll plug my own blog, first of all! I post a lot about my illustrations for Insight Magazine and about my sight loss journey – from mobility training with a long cane, to campaigning work with the RNIB, to events I attend with Henshaws Society for Blind People. It can be found at http://gleamed.blogspot.co.uk and your views are very much appreciated!